Left-wing leadership candidate John McDonnell is the sort of MP who used to give Labour leaders a double dose of the jitters. However, that was back in the 1980s and early 1990s when the hard left, particularly the Militant tendency, were a real force in the Labour movement. And it was before Neil Kinnock and then Tony Blair did their best to purge the party of all such influences and move it firmly on to the centre ground. The left's power has waned dramatically since then, but there are still enough of them - notably Mr McDonnell and the Campaign Group of MPs - to occasionally embarrass and challenge the leadership and, they claim, remind it of the party's roots. Unfortunately, even after Michael Meacher stood aside, Mr McDonnell failed to find the 44 Labour MPs to back him and allow him to force a contest for the leadership. Mr McDonnell may well have won support from many in the unions and constituencies, but he knew he had no realistic chance of winning the election. His campaign, he said, was aimed at widening the debate and ensuring the party was offered a real choice. 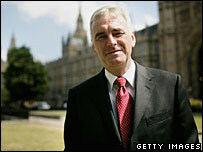 Mr McDonnell has been engaged in politics in his west London constituency of Hayes and Harlington for 25 years. He was the deputy leader to Ken Livingstone - and the borough's representative - on the Greater London Council. He also became its Chair of Finance, overseeing a budget totalling £3bn. A former production worker and an official for the National Union of Mineworkers and Trades Union Congress, he decided to stand for Parliament in 1992. He lost by 54 votes to Terry Dicks, who had the third smallest Conservative majority in the UK following the general election. 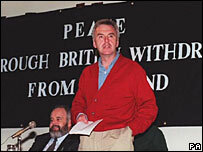 Undeterred, Mr McDonnell continued his campaign to win the seat over the next five years, and was elected as an MP in 1997 with a majority of 14,291. The 55-year-old has been one of the most rebellious left-wing MPs. He is a prominent member of the Stop the War Coalition and has called for British troops to be pulled out of Iraq. He has also voted against the government on issues such as ID cards, the right to detain foreign terrorist suspects without trial and plans to limit access to incapacity benefit. He has called for widespread renationalisation and chairs a campaign called Public Services not Private Profit, which he says "defends public services against privatisation". Mr McDonnell also fiercely criticised Labour for accepting sponsorship from fast food chain McDonald's at its annual conference in 2001. In July, he said he wanted to ensure there was no "coronation" for Chancellor Gordon Brown when Tony Blair left Downing Street. He said he would tour the country to garner support and promised to a return to "grass roots campaigning" to reverse a "very disenfranchised" feeling among Labour supporters. The MP will try to "distil Old Labour and New Labour into Real Labour" and has said his campaign has the potential to "rescue this Labour government from itself". He has called for public ownership of the railways to resume and for revised entitlements for workers.